The idea of the castrati is that these unnatural beasts could perform impossible feats with their high voices. The best of them could do what mere mortals, and certainly mere women, could not. 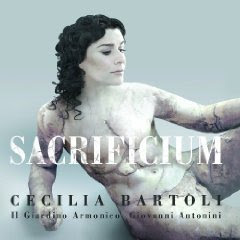 Others have recorded albums honoring castrati, such as Vivica Genaux - Arias for Farinelli and Andreas Scholl - Arias for Senesino, but none have actually tried to rival the castrati by seeming to achieve the truly impossible as Cecilia Bartoli is attempting with her album Sacrificium. Cecilia seems to understand the goal of castrato singing which is to stun the audience into complete disbelief. This happens in “Cadrò, ma qual si mira” by Araia and ”Son qual nave” by Broschi. The breath control exceeds the humanly possible and the range is astounding. I was wowed by Opera Proibita but didn’t really enjoy listening to it. That kind of beating the listener over the head is missing here. At this point in her career perhaps Cecilia is willing to show her natural sweetness, both emotionally and vocally. The song about birds with flute accompaniment, “Usignolo sventurato” by Porpora, is very pleasing. The sweetness of the original instrument orchestra pairs beautifully with the sweetness of the soloist’s performances. I wouldn’t have thought it possible to be this technically stunning and emotionally moving all at the same time. I like it very much.